Letting go of the past can take a long, long time. Tensions do percolate as Riordan (The Devil Went Down to Austin, 2001) opens his sluggish thriller with an auction party to benefit Laurel Heights School in San Francisco. Teacher Chadwick Reyes wants to divorce his wife Norma and be free to marry school headmistress Ann Zedman, with whom he’s having an affair. Norma is distraught, while Ann’s cocky, successful husband John barely represses the anger he feels for Chadwick. Meanwhile, Chadwick’s unruly daughter Katherine baby-sits at home for the Zedmans’ daughter Mallory. Katherine squirms to get away from playing with Barbie Dolls, preferring to do some potent drugs and duck out of her tense life for a while. She takes a fatal overdose. Nine years later, wounds from that night still afflict the parents. Riordan gives each a beat to play, without variation, for the rest of the narrative: Norma is bitter, John seething, Ann unrequited, and Chadwick anguished. A chance for expiation comes when Ann turns to Chadwick for help with Mallory, now an obstreperous teenager all too reminiscent of Katherine. 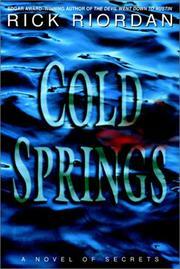 Chadwick takes her to Crystal Springs, a camp outside Austin for troubled youth. Her progress there echoes a tired G.I. Jane boot-camp scenario, when at first Mallory resists the stiff training and discipline, then digs in and decides to change. But is someone watching her at night? Why does she hear crackling branches as she hikes alone in the woods on a final test of endurance and character? Loaded onto the tale is a subplot involving blackmail and the murder of a black woman whose sons were romantically involved with Katherine and Mallory. Along the way, Riordan comes up with some bright descriptive flashes, but they’re like heat lightning on a dry night. One-note characters move through an overlong, slowly paced thriller.